I have been browsing through the second edition of A Dictionary of London Place-Names by A.D. Mills, newly published in paperback by OUP. One of the things that Mills points out is that apart from various river names (Lee or Lea, Brent), the only London name of Celtic origin is Penge, the SE20 suburb, which is derived from a Celtic/British/Old Welsh compound corresponding to modern Welsh pen ‘head’ plus coed ‘trees, wood’, exactly as in Pencoed in south Wales, literally ‘Woodhead’. Some make mock of Penge (an unusual name but not a pretentious place) by pronouncing it superciliously to rhyme with ‘blancmange’. That is, they jocularly call it not pendʒ but pɒndʒ. I have a friend who lives in Fulham ˈfʊləm. Sometimes in jest he similarly refers to it as flɑːm. Mills tell us that the etymology of Fulham is the rather boring ‘river-bend of a man called *Fulla’. In the Domesday Book (1086) it was spelt Fuleham, but in the Anglo-Saxon Chronicle (c. 900) Fullanhamme, with an OE genitive case ending -n on the personal name. The street name Piccadilly has, Mills tells us, ‘rather a bizarre’ origin. It seems that the name first appears as Pickadilly Hall in 1623, otherwise Pickadel Hall in 1636, as a (no doubt humorous) nickname for a house belonging to one Robert Baker, a successful tailor who had made his fortune from the sale of piccadills or pickadillies, a term used for various kinds of collars, highly fashionable at the time, for both men and women. EFL teachers can use ˌpɪkəˈdɪli as a convenient demonstration of the ‘stress shift’ effect when we come to Piccadilly Circus ˌpɪkədɪli ˈsɜːkəs. Alexis Contreras writes from Mexico with what at first sight is a simple and straightforward question. I have been trying to figure out something about the alveolar flap or tap. I'm not sure whether the Spanish r as in words like "pero", "cero", "caro" and the like is the same as the English sound in words and phrases like "matter", "natalie", "order", "water", "how to" "about a" and the like. At first I thought the sounds were the same. But then I started to do some research and began doubting whether or not they were the same sounds. I began leaning towards them not being the same. But right now I'm in doubt again. I think they might be the same, but I'm still not sure. […] Could you please tell me if there is any articulatory difference between the two sounds or not? In saying "English", Alexis is of course referring only to AmE. The usual BrE consonant in the middle of water ˈwɔːtə is very different from the Spanish single /r/ in pero ˈpeɾo. This BrE t is voiceless, slow, perhaps somewhat aspirated and indeed often affricated, whereas Spanish ɾ is voiced, and rapid. But in AmE, on the other hand. the etymological t in the words quoted is a voiced tap (‘flap’, say some) that is indeed very similar to the Spanish /r/, and is indeed sometimes transcribed identically, as ɾ. Are the two sounds merely similar, or are they ‘the same’? Partly the problem is one of asking what we mean when we say that two sounds are ‘the same’. Do we just mean that language learners can safely treat them as equivalent? Or is it deeper than that? More importantly, perhaps, the tongue configuration before and after the consonant may differ considerably in the two languages, giving rise to different formant transitions in the on-glide and off-glide of the segment we are discussing. The clincher comes, though, from x-ray tracings. I reproduce this from Ladefoged and Maddieson’s The Sounds of the World’s Languages (Blackwell 1996). The English speaker has a preparatory raising and retraction of the tongue tip during the preceding vowel […] The tongue is then moved forward to make the contact which is captured in the frame illustrated here, after which it returns to the floor of the mouth. The Spanish tap does not involve any substantial anticipation, but instead has a quick upward and downward movement confined to the tongue tip. It is possible that in the case of water, the word illustrated here, the preparatory retraction of the tongue tip may be in anticipation of the r-coloured ɚ which follows. Would we find the same retraction in a word such as atom ˈæɾəm? I do not know. So what is my answer to Alexis? I think we can say that the two sounds are not really exactly identical, but that for language learning purposes we can treat them as if they were. Some working-class people have the idea that a schwa [in certain places] is lazy and that "posh people" don't use them [but they do, in fact]. Believe it or not, I've come across people who think that you're supposed to say Garforth with final /fɔ:θ/ and Castleford with final /fɔ:d/. I wonder if some announcers have grown up with this idea of correct speech and that it's coming into BBC English now. Truly, there’s nothing new under the sun. Just over a hundred years ago, in 1910, Daniel Jones, then just setting out on his career as a phonetician and not yet widely known, was forcefully attacked by Robert Bridges, the recently appointed Poet Laureate and a founder member of the Society for Pure English. 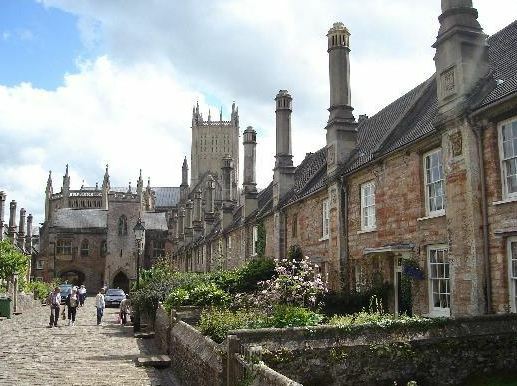 Bridges believed sincerely that the pronunciation of English was gravely threatened by declining standards, and was therefore determined to fight to restore it to what he considered to be its proper state. In Bridges’ view, its proper state was one that closely reflected the orthography. He was particularly concerned with what he termed “the degradation of the unaccented vowels” — by which he meant the use of ə in unstressed syllables. Quoting Jones’s Phonetic Transcriptions of English Prose (Oxford, 1907), Bridges apostrophizes the reader as follows. Now please observe, most gracious reader, that this is not a dream nor a joke. It shows the actual present condition of things, as formulated by an expert, promulgated by the University of Oxford, and recommender ter foreigners. Foreigners are really being taught that the pronunciation of to (tŭ), which is hundreds of years old, is now changed to ter (tə), and that in our “careful conversation” we say ter and inter for to and into. The only question can be whether Mr. Jones exaggerates the actual prevalence of degradation. Some will acquit him of any exaggeration. Others I know very well will regard him as a half-witted faddist, beneath serious notice, who should be left to perish in his vain imaginings. ’Vain imaginings’ is a peculiarly inappropriate characterization of Jones’s carefully observed and accurately reported descriptions of the educated pronunciation of his day. didn’t speak with his reformed pronunciation; his pronunciation was very much like mine, except that he made rather freer use of the obscure vowel to which he took such strong objection. In 1926 Bridges was appointed Chairman of the BBC’s Advisory Committee on Spoken English. Jones, by then Professor of Phonetics in the University of London, was one of its members. 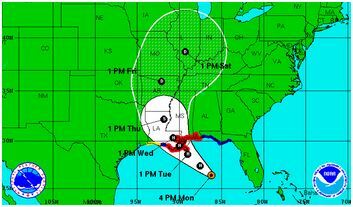 I’ve heard one or two news presenters referring to the tropical storm/hurricane now threatening parts of the US as ˈaɪzæk. But Isaac is of course usually pronounced ˈaɪzək, with the vowel in the second syllable reduced. (Some may reduce it to ɪ instead of ə, as also happens adjacent to the velars in accept and stomach). Another biblical name in which orthographic aa corresponds to a spoken weak vowel is Canaan ˈkeɪnən. For variants of this latter name, see my blog, 6 March 2009. Although we may sometimes have ˈkeɪniən I don’t think we ever get *ˈaɪziək, although you might logically expect that we would. Another, non-biblical, name currently in the news is that of the Russian-American author Ayn Rand. I first came across her Atlas Shrugged when I was an undergraduate. Appalled at her advocacy of selfishness and contempt for altruism, I was not a fan. In those days we gave her first name a spelling pronunciation, eɪn. I note that nowadays people are pronouncing her aɪn, like the German indefinite article or the letter of the Arabic alphabet. Indeed, this is what is given in the Oxford BBC Guide to Pronunciation and in Merriam-Webster’s Collegiate, not to mention Wikipedia. Since her given name was Alisa (Алиса), it is not clear where Ayn comes from, or whether it is English or Russian. Presumably it is a Russian hypocoristic. The guilty verdict and the sentence passed on Anders Breivik, thought the Norwegian commentator interviewed on Sky News, would hopefully bring the whole matter to a kləʊs. We native speakers of English, though, hope (if we do) that it will bring it to a kləʊz. The pronunciation of the various words spelt close is remarkably difficult for the spelling-based learner of EFL — even for those who, unlike Scandinavians and speakers of Spanish, have no difficulty with the s – z opposition and who, unlike Germans and Russians, are not tempted to devoice all word-final obstruents. The verb to close, meaning to shut, has z, and closed, antonym of open, accordingly has zd. Likewise closing and the 3sg (he) closes, both with -z-. The noun used by the commentator is the deverbative form of the same, which is why it too has z. Quite different is the adjective close meaning adjacent or near. It has final s, as do its comparative, superlative and adverbial derivatives closer, closest, closely. An hour to play and the last man in. Teachers will be familiar with another word, homophonous with the verb to close but spelt differently, namely cloze. It refers to a kind of reading test in which someone has to supply missing words deliberately omitted from a passage. This word appears to have been coined by W.L. Taylor in the 1950s, and is supposedly based on closure (which, nevertheless, normally has ʒ). A quick test for NNSs: pronounce correctly close your eyes; hold me close; they’re close friends; too close for comfort; a close shave; a close (sic!) vowel; a close run thing; to sail close to the wind; behind closed doors; drawing to a close, the close season (AmE the closed season). Next up: when is supposed pronounced with z(d), and when with s(t)? The August 2012 issue of the Journal of the International Phonetic Association contains, as usual, several interesting and informative items. The lead article, by Christina Esposito and Sameer ud Dowla Khan, concerns contrastive breathiness in consonants and vowels. Various languages have contrastive breathiness on voiced obstruents, as in the case of Hindi bʰ etc. 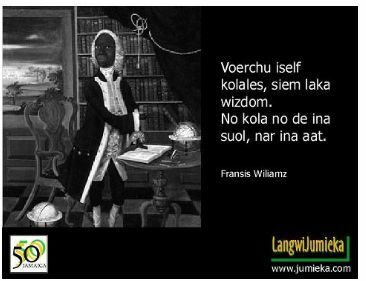 ; some have contrastive breathiness on semivowels or vowels, as in Zulu j̤e̤ɓo ‘yes’ (my example, not the authors’). A very few languages have both contrastive breathy-voiced vowels and breathy-voiced aspirated consonants, including the Gujarati and White Hmong that the authors here analyse. Since both involve breathy voicing during the vowel, the crucial question is, how is the CʰV type distinguished from the CV̤ type? I expect most families have private, family words, used only within the family and never with outsiders. When I was growing up, we certainly did. And special family (mis)pronunciations, too. I’m not thinking just of nursery words for excretion and body parts, though of course we had those. For example, my father and brothers and I (though perhaps not my mother) would often pronounce jug as jʌɡ (“yug”) and jump as jʌmp. My father would tell me to get a ˈjʌɡ əv ˈɒlɪndʒ (jug of orange (squash)) to put on the table for a meal. Whether this betrayed some paternal or precocious filial awareness of IPA and historical phonology (confusion of liquids) I do not know. We also sometimes called ice cream ɪˈkekriæm, obviously in a playful misinterpretation of the spelling. Interestingly, when my German exchange friend Klaus came to stay with us at the end of my stay with his family when I was eighteen, I remember that he misinterpreted this name as Doggers ˈdɒɡəz, which would put it in line with champers ‘champagne’, Johnners (Brian Johnstone the cricket commentator) and the Staggers (the New Statesman periodical). I'm glad to see that the UCL summer course maintains the tradition of using nonsense words for ear-training. Here's Geoff Lindsey (photo: Masaki Taniguchi). 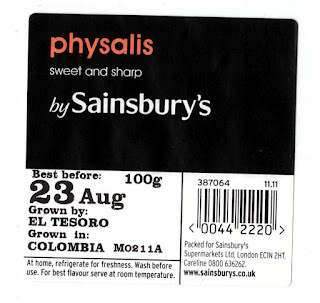 As I wander round the fruit-and-veg aisles in my local supermarket, I know how to pronounce most of the stuff on offer. I know about mooli (I even know that in AmE it’s called daikon), I know about kumquats. 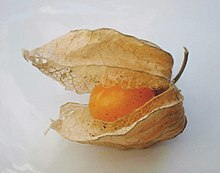 One of the fruit I buy from time to time is physalis (aka Cape Gooseberry, I’m told). But I really don’t know how people pronounce it. I say it to myself as faɪˈseɪlɪs, and that’s what I put in LPD. So it’s one of those scientific terms on whose spelling we agree, but on whose pronunciation there is no agreement (blog, 1 Mar 2007). For what it’s worth, the Greek etymon, ϕυσαλλίς ‘bladder’, has a long upsilon. 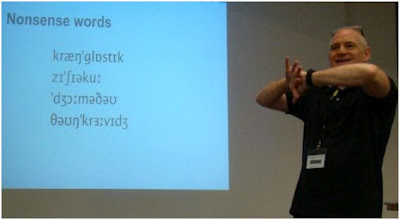 But you only have to consider dynamo, dynamic, and hyper- (all with short upsilon) to see that Greek vowel length is no predictor of the English vowel length. 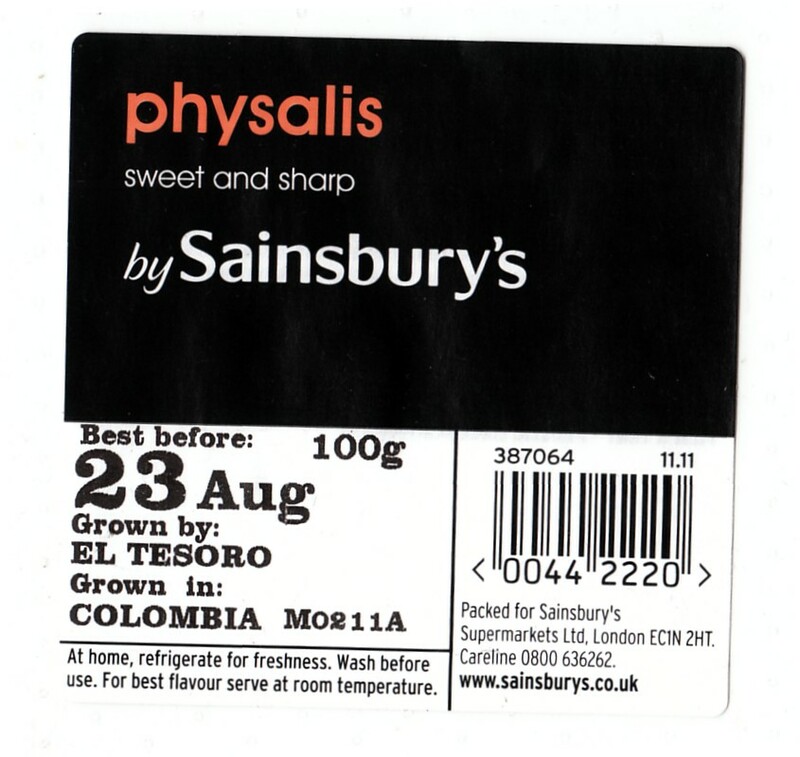 Interestingly, the Greek word also has double lambda, so that the word 'ought' to be physallis, which would no doubt have penultimate stress and æ.
I wonder what the supermarket produce buyers call it. Or, for that matter, the farmers who grow it. Kensuke Nanjo writes to ask about how we accent strings of numbers. I've been wondering where the nucleus is located in a sequence of numbers like “0404”, where the last two digits are repeated items. Given the fact that the nucleus is not placed on the last two in “7252”, is the proper place for the nucleus on the first "four"? It is true that in strings of four numbers (or letters) where the last item is identical to the second we accent them as if contrastive focus were involved, with accents placed on the first and third. But if the first and third items are also identical, this doesn’t apply: we revert to the usual final nucleus placement. When I was working on West Indian English, there were not many observations that I made that were really original. But one that was concerned the semivowel w. I noticed that in Jamaican (and often no doubt in other Caribbean varieties) it has a labial-palatal allophone [ɥ] before front vowels, thus wheel ɥiːl, west ɥes, swim sɥɪm, etc. As far as I know, no one had noticed this before. As with various other features of Caribbean English, this characteristic can be explained as due to a West African substratum. The name of the language, Twi is accordingly pronounced tɕɥi. Although the labialpalatal semivowel allophone made it across the Atlantic, the affrication did not: Jamaican twist is tɥɪs, not *tɕɥɪs. Most of us know, I think, that Standard Arabic has no p in its consonant system; nor, as far as I know, do any of the mostly widely spoken versions of colloquial Arabic (though apparently Iraqi Arabic is an exception). So how come, you may ask, that the largest city in (Arabic-speaking) Syria is called Aleppo, while both in Syria and in Libya there are cities called Tripoli? How can the locals pronounce these names? The answer, of course, is that these are not the Arabic names of the places in question. The Arabic name of Aleppo is حلب Ḥalab ˈħalab, with the expected b rather than p. Aleppo is the Italian name. Tripoli, likewise, is Italian, namely the Italian version of the Greek Τρίπολις Trípolis ‘three cities’. The Arabic name is طرابلس Ṭarābulus, which in Libyan Arabic gets reduced to tˁraːbləs. Again, no p. Simples! Watching the Olympic commentaries on TV, I was struck by the fact that one or two presenters spoke of ˈpʌtɪŋ the shot where I would have called it ˈpʊtɪŋ the shot. We spell the ing-forms of both put and putt identically, as putting; discounting the English northerners who make no cut—put distinction, we distinguish the verbs as pʊt, base form spelt put, and pʌt, base form spelt putt, respectively, despite the fact that the two are etymological doublets, the second being originally Scottish (Scots? ), associated exclusively with the Scottish game of golf. So standard usage (as I understand it) has putt pʌt only in the golfing sense “To strike the ball gently and carefully with a putter, with the object of making it roll along the surface of the green and into the hole” (OED), and put pʊt in all other senses. But some speakers have evidently reinterpreted the distinction so as to give pʌt other (all?) sporting senses, and particularly that of putting the shot. I wonder if they would want to spell it correspondingly, to putt the shot? Apologies — it turns out that the fault was mine, and not, as I thought, Blogspot's. Somehow I had made a tiny error in an HTML tag, using a 'smart qoute' instead of a 'straight quote'. I'll blame my cackhanded post-stroke one-handed typing. Anyhow, the post in question is now visible and everything is sorted out. 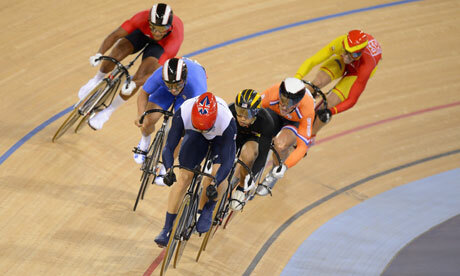 One new word I have learnt from the London Olympics is keirin, one of the forms of cycle racing. Everyone on British TV calls it ˈkeɪ rɪn (despite Steve Doerr’s assertion that “the keiren event was usually pronounced ˈkɪərən in my experience”). This is phonetically interesting, because in BrE we normally get the sequence eɪr only across a morpheme boundary, as in play#room, hay#ride, day-release, way round. Within a morpheme, historical FACE plus r plus a vowel normally develops into eər, as in Mary, various, sharing. The only similar case I can think of is Beirut, which sometimes has eə. sometimes eɪ. Anyhow, we pronounce keirin as if it were spelt kay-rin, K-rin. I find that the word is actually borrowed from Japanese 競輪, or in kana ケイリン, keirin, keerin. (In Japanese ei and ee are not distinct.) I don’t know if this word has an accent in Japanese, or if so which mora it is on. The OED dates the word to as long ago as 1957. Steve’s version looks as if it could have been influenced by the man’s name Ciarán or Kieran, which is regularly ˈkɪərən. Londoners are used to hearing American (or other overseas) visitors struggling with what to us are very familiar names such as Leicester ˈlestə(r). We fail to realize how far from transparent the spelling is in such cases. Sometimes, though, it’s we Brits who are caught out by American names whose spoken form is just as surprising, in view of the spellinɡ. We may know about Houston and even Poughkeepsie pəˈkɪpsi — but I was brought up short recently by Ashtabula, Ohio. I wonder if anyone can tell us how Temecula, California, is pronounced. according to the parish council clerk, that is an older local pronunciation which isn’t used quite as much now; most locals prefer ˈwɒdfəd. Anyway, it’s certainly not the *ˈweɪdfəd that the spelling would seem to suggest. All of the UK —and particularly all of London— is still on an Olympic high. We feel euphoric, full of goodwill to all, proud of who we are, proud of what we have achieved, very special. But I must descend from the sublime to the trivial. There were two Olympic athletes in Team GB whose names are susceptible in BrE to intrusive r: the heptathlete Jessica Ennis ˈdʒesɪkər ˈenɪs and the boxer Nicola Adams ˈnɪkələr ˈædəmz. Nicola’s opponent in the final bout was the Chinese boxer Ren Cancan. My colleague John Maidment has written (ranted) elsewhere about commentators’ mangling of Chinese names because of not understanding the spelling-to-sound conventions of Hanyu Pinyin. The BBC commentator wasn’t too bad with Ren (Chinese 2ɻən), but the temptation of rendering Cancan (Chinese 4tsʰan 4tsʰan) as if we were at the Moulin Rouge was too great, and she was repeatedly called ˈkænkæn. I’ve written a day-by-day account of my stroke here. It’s seven weeks now since my stroke, and I’ve been back home from hospital for some time. Clearly, I’ve been very lucky: as strokes go, mine was a mild one. I can talk, I can walk. The only problem remaining is weakness in my left arm and clumsiness in my left hand. I didn’t restart my blog earlier because so much of my time was taken up with thrice-daily visits from the team of physiotherapists, occupational therapists and speech-and-language therapists, and doing the exercises they prescribed. But now the physios (who deal mainly with balance and walking) have decided that their work with me is over: I’m back to normal. The SLT (who deals also with eating, drinking and swallowing) has decided likewise. The only visits now are from the occupational therapist making me work on my left hand. Even here I’ve passed several encouraging milestones: tying my shoelaces, opening a tin with a two-handed tin opener, unscrewing screw-top jars and bottles, buttoning and unbuttoning my shirt. Anyhow, I’m going to restart this blog next Monday, 13 August, to coincide with the start of UCL’s annual Summer Course in English Phonetics. 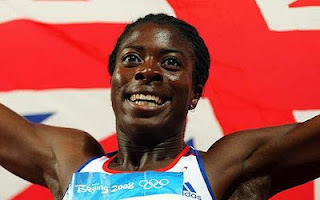 Not everyone knows that Christine Ohuruogu, winner of the silver medal in yesterday’s Olympic women’s 400m race, is not only a brilliant athlete but also a linguist: she holds a BA in Linguistics from UCL. So she’s been properly trained in phonetics.